What do I get when I purchase a Lovefraud CE course? First of all, you get valuable insight from people who truly understand how manipulators — including sociopaths, narcissists, borderlines and psychopaths — exploit their targets. In fact, most of our instructors know what happens first hand, because they were targeted themselves. Our Self Study On Demand webinars are available immediately. Just sign up and start. Lovefraud also offers Live Online courses, in which the instructor presents the webinar at a specific date and time. When you join these live courses, you have the opportunity to ask questions and have them answered immediately. Upcoming Live Online courses are announced on the Lovefraud CE home page. Each course, both Self Study and Live Online, includes a private forum where you can interact with other learners and ask questions of the instructor. Psychologists, social workers and educators can earn continuing education credits. Professionals who earn eight Lovefraud CE credits are eligible for a free one-year listing in the Lovefraud Professional Resources Guide. I bought a course. Where do I find it? All of your courses are listed in on the My Courses page. Just click the link and you will be taken to your course. If you do not see these emails, please check your spam filter. The live broadcast is recorded and within two days it will be available to you on-demand. You will find it on the My Courses page. Your course will include one or more lessons, such as a webinar, and a review. Courses for continuing education credit also include a final quiz and an evaluation. When you complete your course you’ll see a button to print your certificate. You can also print your certificate from the My Account page. When you sign up for courses for survivors, you have access to them forever. So you can review the material as often as you need to. If you are a professional taking courses for continuing education credits, be sure to complete the quiz and print your certificate. Lovefraud maintains your course records for six years. Can I ask questions of the instructor? Yes. If you take a Self Study On Demand course, you may post questions for the instructor in the private forum. The instructor will respond, based on his or her availability. If you want questions answered in real time, sign up for one of our Live Online webinars. Can I interact with other learners? Yes. Each course includes a private forum. That’s where you can share comments and experiences. Lovefraud offers Live Online courses, in which the instructor presents the webinar at a specific date and time. When you join these live courses, you have the opportunity to ask questions and have them answered immediately. Upcoming Live Online courses are announced on the Lovefraud CE home page. Do Lovefraud CE courses provide continuing education credits? Lovefraud Continuing Education is a program operated by Lovefraud Education and Recovery, a New Jersey Nonprofit Corporation. Continuing Education credits are available for psychologists, social workers and educators. For more information, please visit the Credits page. What are Lovefraud CE's goals for mental health professionals? Identify possible DSM-5 traits of antisocial, narcissistic, borderline or other personality disorders in client descriptions of exploitation experiences with someone close to them. Detect client psychological disorders occurring in the context of manipulation and/or abuse by a personality disordered individual. 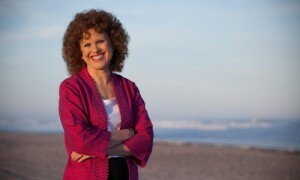 Explain the techniques disordered individuals use to seduce, manipulate and destabilize intimate partners. Recognize when personality disordered individuals are engaging in manipulative behavior directed toward mental health providers. Select the best treatment options for clients who are involved with personality disordered individuals. 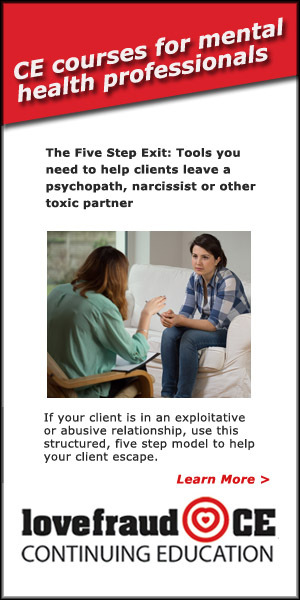 Use best practices to help clients recover from exploitation and emotional abuse. Yes. When you complete your course, you’ll see a button that says, “Print your certificate.” You can also print your certificates from the My Account page. If you are a professional and taking a course for continuing education credit, you will need to complete the final quiz and an evaluation before you can print your certificate. Can I see a record of my purchases? Yes. The My Account page lists all of the courses you are enrolled in. Below the course list, under “Your payment information,” you’ll see a record of your purchases, including all of your purchase receipts. Can I share Lovefraud course materials? 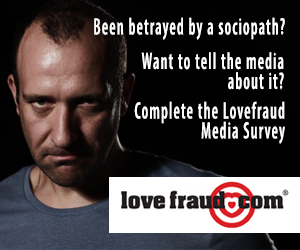 Lovefraud courses are for your personal use only. If you know others who need the information in our courses, please encourage them to purchase a course themselves. All purchases support the work of Lovefraud Education and Recovery, a New Jersey Nonprofit Corporation. All courses are the copyrighted property of the instructor. Sharing any course materials without the written permission of the instructor is a violation of copyright law. Yes. Lovefraud offers a money back guarantee. If you are not satisfied with your course, your money will be refunded. I have a question or a problem. Who do I contact? Please contact Terry Kelly at terry@lovefraud.com, or call 609-945-1384. I'd like to offer a Lovefraud CE course. Who do I contact? Lovefraud CE is always looking for qualified instructors to present courses related to exploitative personality disorders. Please contact Donna Andersen, the program administrator, at donna@lovefraud.com.